This week we feature two stories relating to bodies of water; Girl Gone Wild correspondent Jamie Pratt and Chris Chang-Yen Phillips take a journey in search of Lake Sturgeon and Jennifer Wickham shares her poem, “Engussi Wedzin Kwah” about the sacred waters in her traditional territories. Also, Rebecca Rooney speaks to urban ecologist Jason Aloisio about Green Roofs in a piece from our archives. The subject of Jennifer Wickham’s poem, the river Wedzin Kwah, in Wet’suwet’en Territories. Photo credit to Jennifer Wickham. For our new Terra Informa segment on environmental poetry, Annie Banks spoke with Jennifer Wickham this month. Jennifer shared her poem “Engussi Wedzin Kwah”, about sacred waters on her traditional Wet’suwet’en territories, and also some of her thoughts on poetry, the role of a poet and what’s currently inspiring her writing and resistance. **Correction! ** Jennifer’s book of poetry will be coming out in summer 2013. 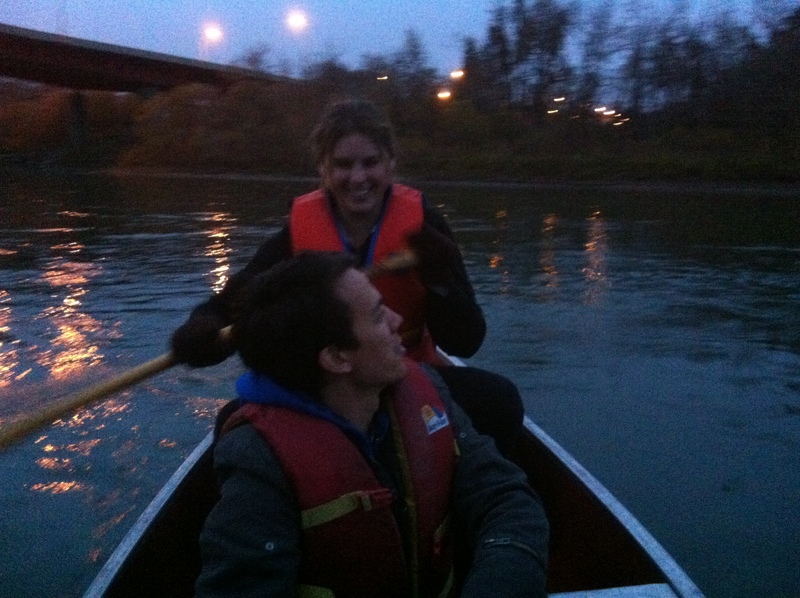 Chris Chang-Yen Phillips and Jamie Pratt in a boat; photo credit Erik Bisanz. Well every now and again Terra Informa correspondent Chris Chang-Yen Phillips takes a trip with our resident wildlife expert, Jamie Pratt. She’s the creator of the Girl Gone Wild wildlife documentary series, and this time we decided it was time to journey down Edmonton’s North Saskatchewan River in search of an ancient fish — the Lake Sturgeon. Jason Aloisio is an urban ecologist, working at New York City’s Fordham University. He was recognized in 2011 for his work by the Ecological Society of America at their annual conference in Austin, Texas. From our archives, Terra Informa correspondent Rebecca Rooney ventures to Austin to catch up with him to ask about his research into green roofs. The Parkland Institute will be hosting their 16th annual conference next weekend in Edmonton. The Petro, Power and Politics conference is themed around the issues surrounding oil and gas development. An Inspired Future – Student Application now open! February 6, Toronto. Are you a post-secondary student interested in environmental issues and corporate social responsibility? You’ll want to check out the student application to attend the upcoming An Inspired Future conference next February 6th in Toronto. The UBC Student Environment centre and Cinema Politica UBC are hosting a screening. Dr. Evan Fraser releases a new website looking at the global food crisis. 6pm Thursday – McGill – BANANAS! sheds light on the case of pesticide use by Dole in Nicaragua. 7pm Monday November 26 – Concordia – David Fedele E-wasteland and the Lightbulb Conspiracy. ← Terra Informa At Night!